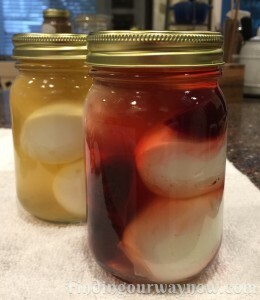 Pickled eggs are simple and easy. Some like them, some don’t like them because of what they are. If they could get past that, they might just find out how much they enjoy these guys. They are such a treat by themselves, in a salad, as part of an antipasto plate or as an appetizer. The first time I saw a pickled egg, it was at a pub. On the back counter in full view, they had giant jars of pickled eggs. They were served freely to any patron who came in to enjoy a pint or two. That was the first time I ever had a pickled egg, and I was hooked. In the past, as it is with many foods, brining or pickling offered a way to preserve certain foods so that they could be consumed months later. 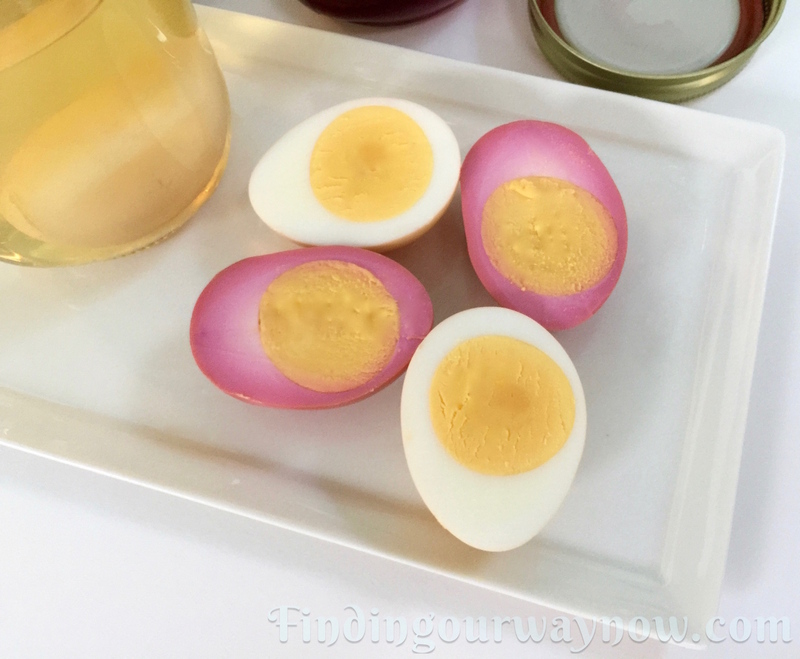 Pickled eggs became popular as a snack or hors d’oeuvres, in pubs, bars, and taverns around the world in places where beer is served. 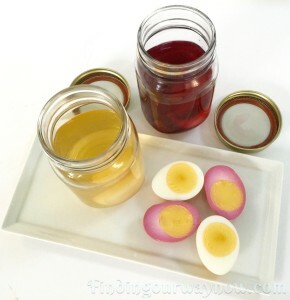 Now let me offer my version of pickled eggs two ways. Clean and sterilize two pint jars and lids. In a non-reactive saucepan, combine the two vinegars, salt, sugar, and water. Bring to a boil; reduce to a simmer for five minutes. Using a canning funnel, pour the hot brine over the eggs. Cover and refrigerate the two jars for at least 6 hours or overnight. They will keep in the refrigerator for up to 2 weeks. Notes: Why week old eggs? That is one of the factors when trying to achieve easier to peel boiled eggs. After buying my eggs, I’ll wait a week before boiling them. The key to this recipe is making sure the eggs are cooked properly. For that reason, I use an inexpensive egg cooker tool. It’s cheap, and it makes cooking hard boiled eggs foolproof. Why use beets? It’s not for the flavor; it’s for the color. If you prefer to leave the beets out, that is fine. If you do that, you might want to put all the eggs in a quart jar with the brine. Either way, they taste just as fabulous. Other Flavors Options: This is a very basic recipe. For a sweeter version increase the sugar to ⅓ cup in the brine recipe. 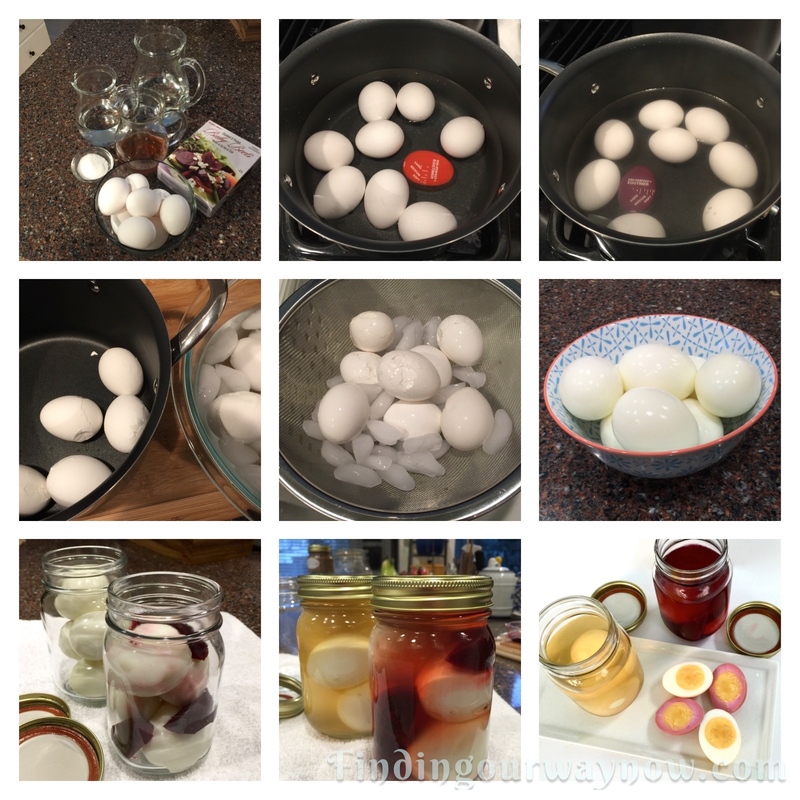 Many flavorings can be added to the jar with the eggs and pickling brine such as garlic, fresh dill, tarragon, mustard seeds or a combination. The fun part is, you can experiment and make your own family favorites. I do love the color of the eggs with the beets. Serving both at the same time is fun, not to mention how easy they are to make. Regardless of the color, they are both superb. If you enjoyed this Pickled Eggs Two Ways, check out my Crunchy Garbanzo Bean Recipe, Warm Pesto on Goat Cheese, and Roasted Olives. Enjoy.